I was born with hip problems which resulted in a pronounced limp. Confronted with the need for extensive surgery so I could walk normally, I began to seek a lifestyle that would support my recovery and help me suffer less from the ravages of repeated surgery. I studied physics, engineering and mathematics at university, undergraduate and graduate levels, both in Russia and here in the U.S.A. It takes a modicum of smarts to study those, and I did pretty well. But gradually, I found myself more and more immersed in the science of health and nutrition. Vegetarian and then vegan eating drew me in. Eventually, I became convinced my lifelong quest for health and beauty would find its success in the raw food lifestyle. And, since 1997, I've been completely raw. Going raw has helped me - as it will anyone - arrest the post-40 slide into weight gain, flab, and the various other cumulative effects of poor dietary choices. What's more, it has countered the grave consequences of surgical trauma, general anesthesia, and pain - the legacy of my young adult life. This raw food lifestyle, along with carrying me through personal challenges, has also brought my health and looks to an all-time best. This lifestyle opened a new chapter in my life. My belief: that the roots of under-performing lie in feeling and looking less than your best, as I once did. I'm convinced that by eating the way nature intends, everyone can look uniquely beautiful. I founded Memphis, Tennessee's first raw food support group back in 2001. Motivational speaking and my own publishing company, BR Publishing, grew organically from this first venture. Added later: a natural beauty products line - BEAUTIFUL ON RAW. I felt both humble and vindicated when my first book, Your Right to Be Beautiful, was named a finalist for the ForeWord Magazine's Health Book of the Year award for 2004. Though it didn't start out this way, writing has become a favorite pastime for me. I believe very much in using what life has given you. Consequently, in my lectures, talks, demonstrations, and writing, I mix into my main course the spices of humor, my Russian background and sensibility, and my grateful perspective toward my new home, the United States of America. That mix includes also both scientific research, with quantitative data and anecdotal evidence, plus more than a dash of inspiration. If you see some inner strength in me, great. But it's your inner strength, plus the extraordinary benefits of raw foods, that will transform you. Audiences tell me my story helps and inspires. But in the end, it's not about me. It's all about you, and what you can achieve. It's your story - and your potential - which interest me most. In recent years, I've busied myself researching and writing about achieving superior health and beauty. 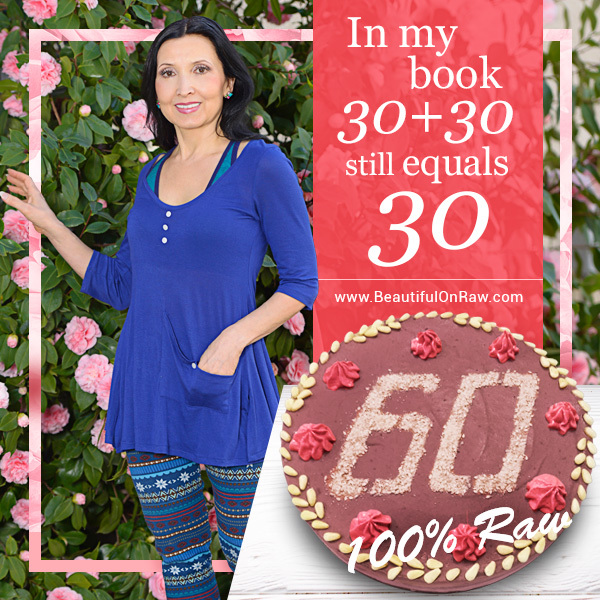 I've developed a unique anti-aging routine for radical rejuvenation in health and beauty - my Quantum Eating. I've also developed a complete facial exercise routine, Rawsome Flex.I daresay a raw lifestyle can improve even your writing skills. It's given me enough to pen five books and two e-books on the raw foods lifestyle, all in English. And now… Russian, too! 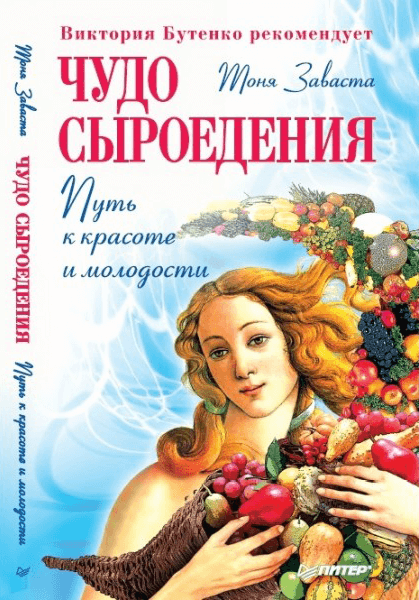 My first Russian language book, Чудо Сыроедения, the translated and adapted version of Your Right to Be Beautiful: Miracle of Raw Foods, came out in 2012. 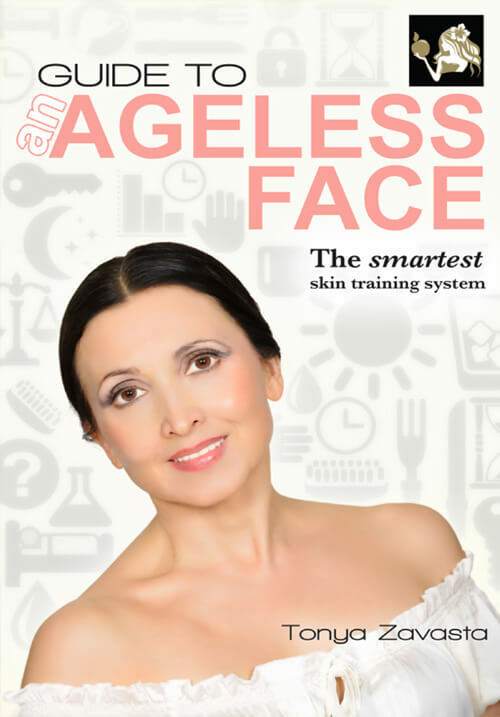 My next creation was Guide to An Ageless Face, where I outline the skin training system that I have devised. It contains every beauty technique that I now use or have successfully used. My "System" does not rely on any invasive procedures nor does it accept short-term results - instead it uses the skin's marvelous and innate properties of rejuvenation to get you to your goal of having an ageless face--always keeping in mind my maxim that health and beauty are vitally connected vessels, and as a result, never sacrificing health for beauty. You wouldn't say I'm a media darling, by any means. But beginning with a local TV appearance, demonstrating how to make a green smoothie, I have made it to national television. CBS Evening News interviewed me on the benefits of raw foods and the raw lifestyle's influence on family life. The U.K. - based raw foods magazine Get Fresh! featured me on its cover in 2009. One well-known book, Raw? Your Biggest Questions Answered, has branded me one of the world's leading raw foods experts. A widely circulated Russian magazine, the September, 2011 issue of Красота и Здоровье (Beauty & Health) featured my discussion of raw foods and a selection of raw food recipes. I've been anthologized, now, too, penning a chapter for editor Nomi Shannon's What do Raw Fooders Eat, Discover What the Successful Ones Do, Volume II. More recently, EternityWatch Magazine featured me on its cover in 2013. In 2006 I started my Beautiful on Raw product line. I never dreamed how much it would blossom. What started as a purely personal effort to concoct my own natural facial cream, my ‘secret weapon' for a radiant complexion, became a formula so successful I just had to make it available to others. From that simple beginning came my unique Facial Cream with Sea Buckthorn Oil. It's always been that way. I need something. So I experiment… evaluate… refine… and arrive, finally, at an ideal product that works wonderfully for me. If a product will meet my exacting standards, it will work for you as well. I don't ‘settle' or compromise. Nothing less than the best will do - that's my firm standard. The BEAUTIFUL ON RAW product line has expanded over the years to include special items for skin, hair, and teeth, as well as for general health and anti-aging. The objective, every time: to keep every product, every ingredient as pure, as clean, as natural as humanly possible. I'm determined to stay youthful, whatever my chronological age. With all who share that ambition, I'll share the products I personally use. Most of the items in my product line I use every day. Daily, I receive emails and letters from customers equally pleased with the unique items we offer to women and men alike. 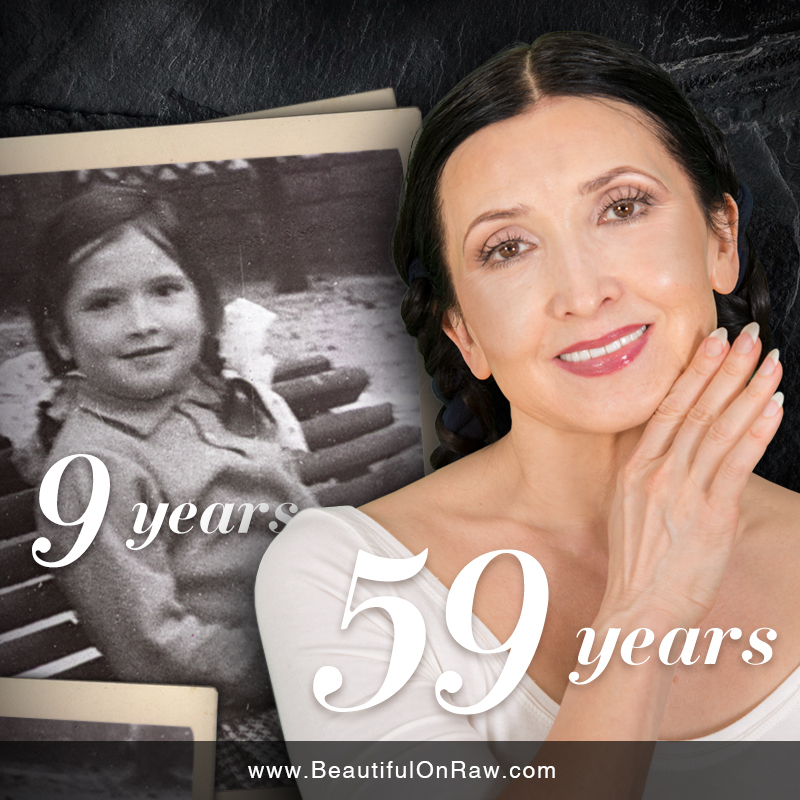 Beautiful on Raw is my personal contribution in helping spread my message of radiant health and beauty around the world.